If you live anywhere in Nebraska you are aware of the flooding that is occurring right now in many parts of the state. I have heard some references to this being “the worst ever” and in some parts of the state I am sure it is probably as bad as it has ever been. But, this is life in the Great Plains. Remember how dry it was just a few years ago? Our weather patterns are always changing; it has been wet before, will be wet again; it has been dry before, will be dry again. There is no doubt there are going to be damages and some things will not be fixed for weeks, maybe months. Some folks will suffer loss from all of this, and we feel for you. Our fisheries will be impacted too. Unfortunately there have been some waters like Lake Ericson where the dam was washed away and who knows if that will ever be the same again? Goose Lake has extremely high water levels right now. Carp exclusion structures were built at Goose Lake when the Aquatic Habitat Rehabilitation Project was completed a few years ago, http://outdoornebraska.ne.gov/fishing/programs/aqhabitat/AQreports.asp?region=Northeast , and those structures were designed to be higher than a certain amount of flooding, but I am afraid what we have now is way beyond that and there may be carp re-invading Goose Lake and other waters even as I type this. We will see what fisheries look like after all of this and manage them accordingly. Please do not think I am cavalier about all of the flooding and the problems it causes, but I want to point out that there are some benefits to our fisheries. First of all, let me talk about rivers and streams. Flood events are very important to the health of river and stream ecosystems. Flood events re-connect rivers and streams to their fertile flood plains. Those high water events result in an influx of “productivity” into rivers and streams; flooding “re-sets” river and stream ecosystems. High water events are dynamic forces that create new channels, sand bars, and other habitats in rivers and streams. High water events are beneficial to the health of rivers and streams and the fisheries in those waters. In fact damming, channelization, diking and dredging of rivers and streams alter the natural processes and can have significant negative impacts. That is very much the reason there are concerns about species like paddlefish and pallid sturgeon in the Missouri River right now. The life history of many river and stream fish species depends on the changing water levels. Annual high water events, spring rises, are critical to the spawning success of many river and stream species. As a matter of fact, years of the highest water levels are often the years that produce the largest year-classes of fish. That reminds me of a story . . . .
Back in the summer of 2007 we had both the hook & line and bow & arrow freshwater drum state records broken within a month’s time. Both of those record fish were taken from the Gavins Point Dam tailwaters. Hook & line freshwater drum state record taken on June 23, 2007 from the Gavins Point Dam tailwaters. 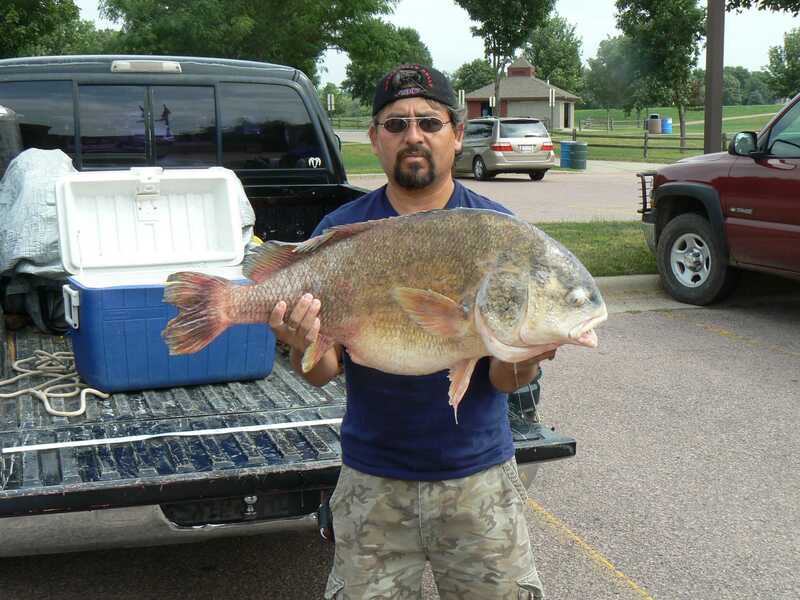 Archery freshwater drum state record taken on July 23, 2007 from the Gavins Point Dam tailwaters. Both of those drum were exceptional fish! The one taken by rod & reel weighed nearly 30 pounds (29 pounds 6 ounces) and the one taken by archery weighed nearly 23 pounds (22 pounds 13 ounces). Those are huge drum, fish that big are rare. I thought it was very curious that we would have two such fish taken within a month of each other and both taken from the same body of water! Now many of you know that I am a somewhat cynical, pointy-headed biologist type of guy and two exceptional fish like that from the same body of water within a month could be just a coincidence, but I suspect there is something more. I have no age & growth information for those fish, but may I do a little bit of pointy-headed fish biologist speculating? Two big drum like that likely would have been near the same age, if not from the same year-class. 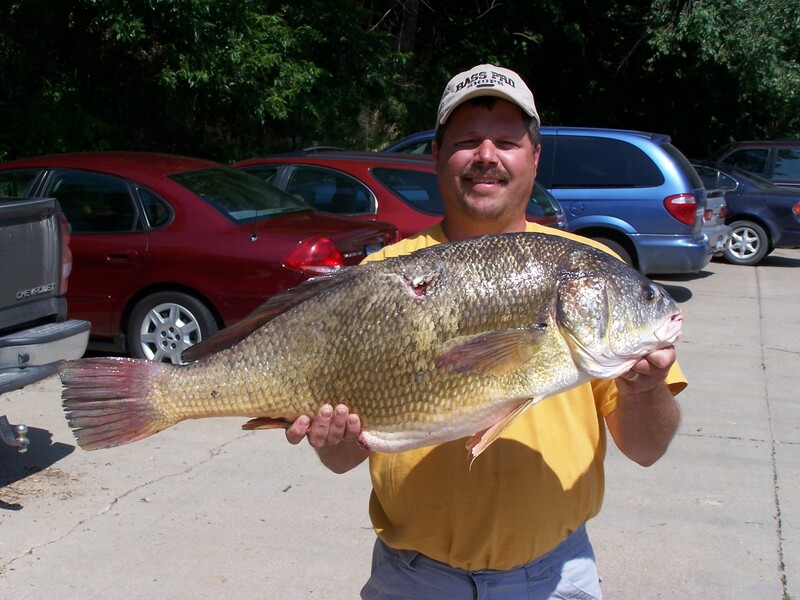 You do not suppose that there were certain river conditions when those fish were spawned that produced a big year-class of freshwater drum in the Missouri River? A big year-class of fish that could have had a few survivors live long enough to reach record proportions? You do not suppose those fish could have originated from a year-class produced by the flooding of 1993? Huge year-classes of a variety of river species were documented up and down the Missouri and Mississippi rivers following the floods of ’93. I believe those two record drum might have been products of that flooding and 14 years later became Nebraska state records. High water levels in standing waters, lakes, reservoirs, pits and ponds, can also be a benefit. Now if you have a pit that gets flooded from an adjacent river, that is usually a bad thing. I have seen pits that literally filled with silt and sand during flooding and ceased to exist. If you have a pit that floods, you can almost guarantee it will end up having a bunch of unwanted species of fish once the water recedes. So, again there can be many negative impacts from flooding, but assuming there is no invasion of unwanted species, high water can produce some of the same beneficial habitat conditions in standing bodies of water that I mentioned for rivers and streams. Water levels fluctuate dramatically on many of our Nebraska reservoirs, especially our irrigation reservoirs. Higher, more stable water levels are beneficial for fish production in reservoirs. High water and an abundance of flooded cover can make the fishing more challenging, but again those habitat conditions are very fertile and favorable for the reproduction, survival and growth of reservoir fish. Some species of fish in our reservoirs especially will benefit from high water levels and flooded cover; panfish species in particular. High water levels in reservoirs can create a “boom” in panfishing that has not been seen in years on some of those irrigation reservoirs. Our sandhill lakes comprise by far the majority of the natural lakes found in Nebraska. Water levels on sandhill lakes may not fluctuate dozens of feet like they do annually on our irrigation reservoirs, but they do fluctuate. Right now the sandhills region of Nebraska is full of water!!!!! We have more water in our sandhill lakes right now than we have had years. You want me to make a bold prediction? 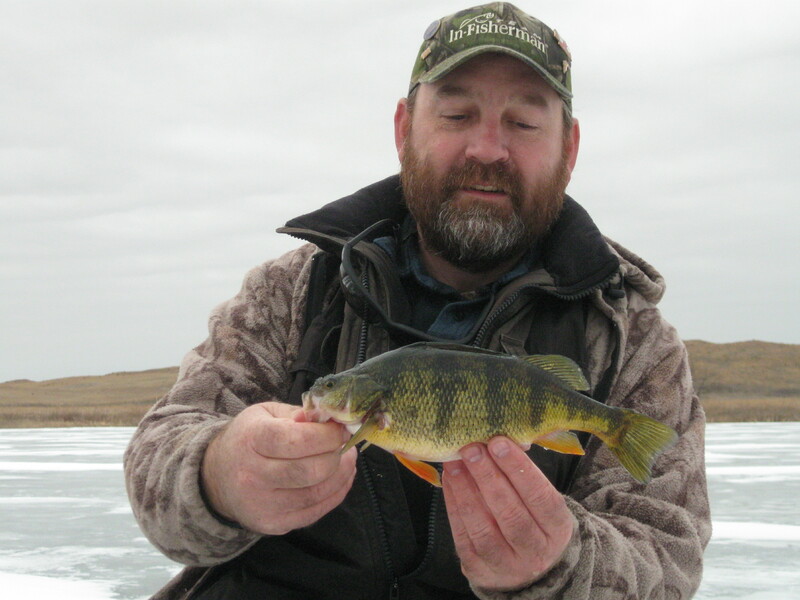 A few years from now, there is going to be some excellent fishing, especially fishing for panfish species, bluegills, yellow perch and black crappies, in the sandhills! We are Nebraskans, we are used to droughts, floods, blizzards, hail-storms, tornadoes, wind, etc., etc., etc. What does not kill us makes us stronger. There will be some negative impacts from the current flooding and it will hurt. But there are some silver linings too. I am so heart broke about Gracie Creek. I and a great friend were just there not 2 weeks before and were having a great weekend of catching white bass across the road from Gracie. Alas, time will prevail and it will be fixed. Until then, let’s hope this years fishing at calamus isn’t hampered too much. This is not the first time the Gracie Creek Pond and the road have been washed out. It will be back. 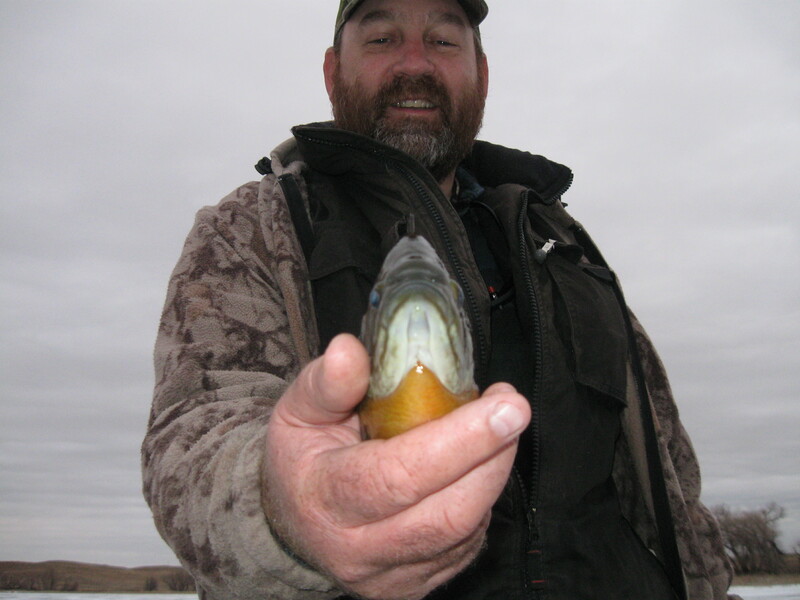 The changing weather and water conditions can make the fishing tougher at Calamus, but in the long run all this water will be good for the fishery–fish need water!